It is still very much winter here in New York, which means that warm and cozy breakfasts are the name of the game. At the moment, cooked fruit is very appealing to me (baked bananas, warm blueberry sauce…you get the idea). 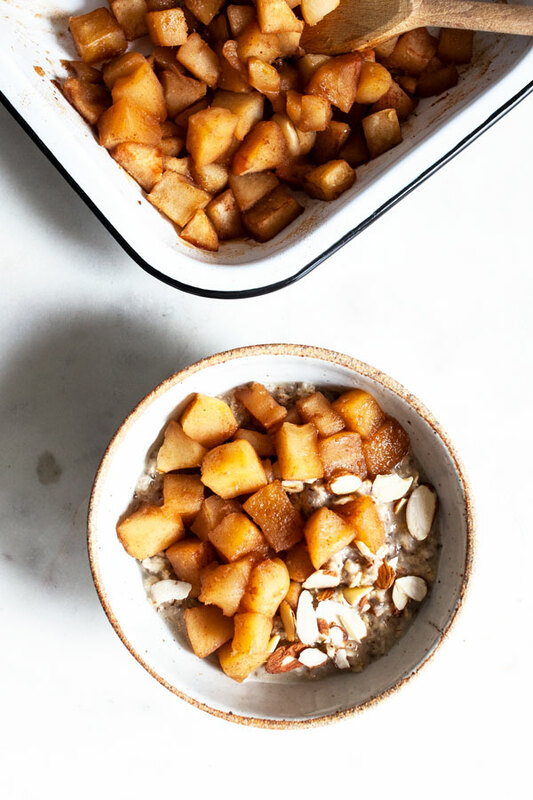 These simple, baked gingery apples are my new favorite topping for oatmeal and toast, and they’re versatile enough to serve as a healthful dessert, too. You can use any type of apples to make this recipe, but I was lucky enough to try Ambrosia apples for the first time. Ambrosias are quickly becoming prized for their sweetness, crispness, and beautiful bi-color exterior. They’ve got a honey-like flavor and aren’t very tart, which makes them especially nice for sweet recipes and treats. 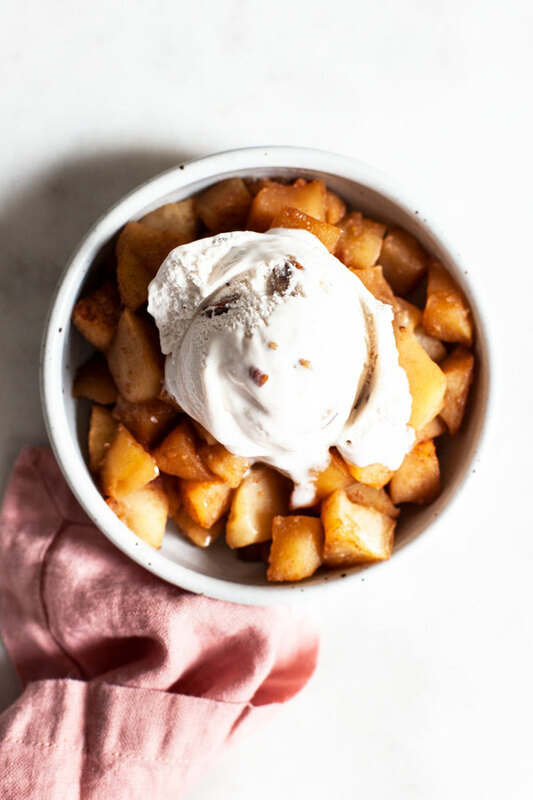 Even though the Ambrosia apples are sweet, crisp and great to eat fresh out of hand, they’re also perfect for this baked apple recipe, which isn’t so different from making baked applesauce. I’d imagine it’s easy to make the recipe more or less complex: you could add a ton of different spices, add a little cornstarch to thicken it up, make it more or less sweet. I’ve been using a ridiculously simple formula of 1 1/2 lbs peeled and chopped apples (you could leave the skin on if you wanted more fiber from the dish), a tablespoon of coconut sugar, a pinch of vanilla, a pinch of cinnamon, and two teaspoons of freshly grated ginger root. The ginger is adjustable: more or less would be just fine. When I first made the apples, I used cornstarch, but I’ve found that the texture is just right without any thickener; I start by baking them with foil, so that they get nice and juicy, and then I bake them uncovered for 10-15 minutes so that they thicken up. In the end, they have a perfect texture: thicker than applesauce, softer and more spoonable than a whole baked apple would be. Here’s the recipe. 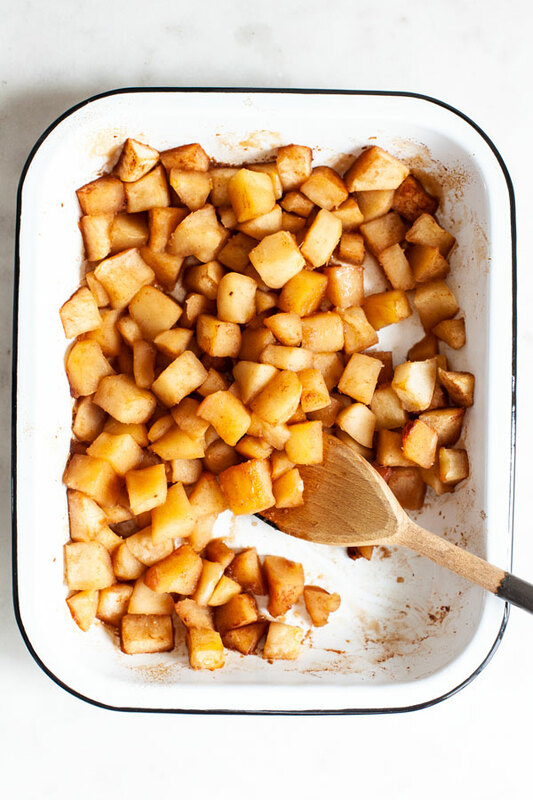 These simple, ginger cinnamon baked apples are so easy to make and so versatile. They’re perfect on oatmeal or with a scoop of dairy free ice cream for dessert! Preheat your oven to 350F. Lightly oil a medium sized square or rectangular baking dish (mine was 7 x 13 inches; 8 x 8 or 9 x 9 square is fine, too). In a large mixing bowl, toss all ingredients together. 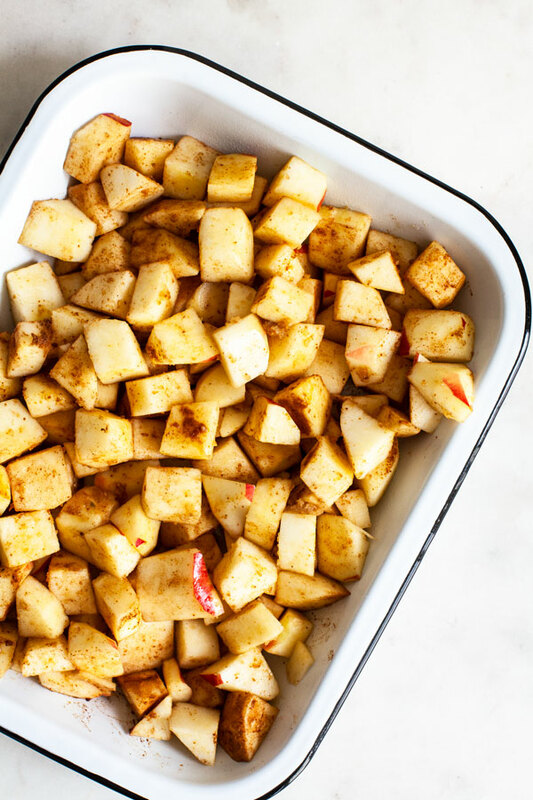 Transfer the apples to your baking dish. Cover the dish with foil. Bake for 30 minutes. Give the apples a stir, then remove the foil. Bake for another 15 or so minutes, or until the apples are tender, golden, and the juices have thickened up a bit. The apples are just perfect with warm oatmeal; that’s how I’ve been eating them the most often. But they also make for a nice, wholesome dessert, especially if you have a hankering for baked fruit but don’t particularly feel like making pie, crisp, or crumble. I like to serve them with a nice big scoop of vanilla vegan ice cream–yum! 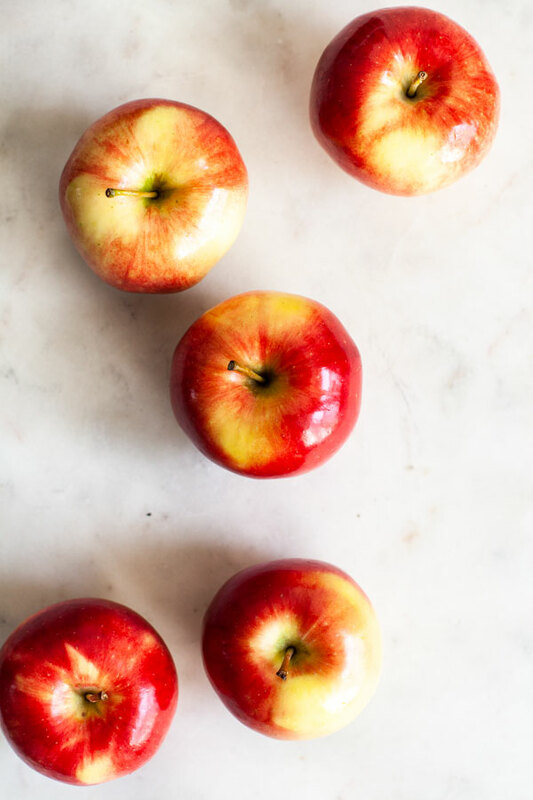 If baked fruit isn’t your thing, or isn’t what you’re craving, the nice thing about the Ambrosia apples is that they naturally take longer to oxidize, so the freshness can be maintained for a while after the apples are cut or sliced. They’re great for fruit salad, or for serving to kids, who can be sensitive to the color of foods. You can learn more about the apples and how to enjoy them here! 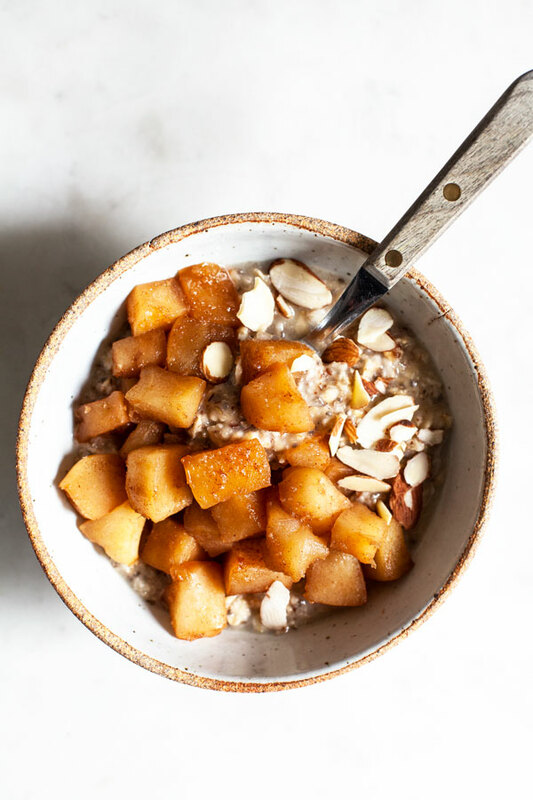 I’m happy to have an easy, healthful way to sweeten and jazz up my breakfasts, desserts, and snacks. Speaking of which, a new week of my DI is in full swing, and I’d best get back to it. Till later this week! This post has been generously sponsored by Ambrosia Apples from BC Tree Fruits, home of the original. The opinions and language are my own and in no way do they reflect BC Tree Fruits. Thanks for your support!